Photo: Speight, Kettering, The Book of The Cat (1903) by Frances Simpson. Image courtesy of The Harrison Weir Collection. 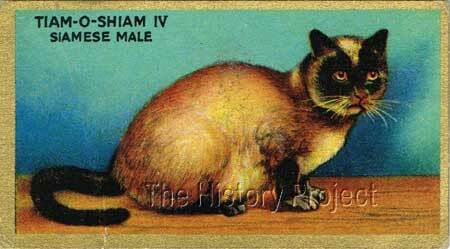 At the height of his career, 'Tiam O'Shian IV' was described as 'the best Siamese Male in England'. He stood at the end of a line of 'Tiam O'Shian's and was himself, the double son of 'Tiam O'Shian III', whose influence on the breed up until that time ,had been substantial. His sire had produced a string of the best and most successful show quality Siamese females seen to date, which had included the famous 'Polyphema', and her daughters, 'Champion Eve', 'Ah Choo', and 'Suzanne', and now two sons, in the form of 'Tiam O Shian IV' and 'Vishuddha'. Whilst it is true that 'Tiam O'Shian IV' resided with Mrs. Parker Brough whilst Mrs. Vyvyan was abroad, and that he was descended from what was in fact the joint lines of Mrs. Vyvyan and Miss Forestier-Walker, he was not the sire of 'Champion Eve', or 'Suzanne', who were in fact his full siblings, Miss Simpson mistaking him with his sire, 'Tiam O Shian III'. It is appropriate therefore to digress here a little and take a look at the path to 'Tiam O'Shian III' who was born before 'Ch.Wankee' and who, like him, was a key progenitor of the modern Siamese breed. The first specimens of this utterly unique and much-loved breed of cat, were brought to England most likely around the 1860's. We know from the notes on this breed by Harrison Weir, that among those lucky few who first possessed them, was Lady Dorothy Nevill, whose cats were "imported and presented by Sir R. Herbert of the Colonial Office. The late Duke of Wellington imported the breed, also Mr Scott of Rotherfield. "12 In context, Lady Dorothy was an avid importer of plants and animals, particularly birds, all of which were cultivated and displayed in the extensive grounds of her estate at 'Dangstein' in Kent. 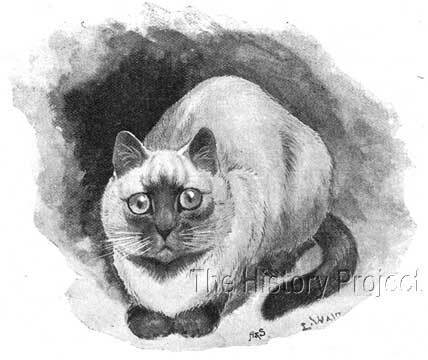 It is also known that Siamese cats were in attendance at the very first Crystal Palace Cat Show, in July of 1871, and in that case the owner/exhibitor is named as Mr. Maxwell, and were reported as "said to be the first of their kind ever brought to this country".13 We also know that Lady Dorothy, also entered some of her cats, either at this show, most likely at the subsequent show held at the Crystal Palace in December of 1871 and again in May 1872. 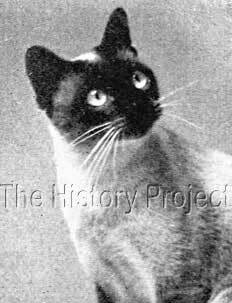 'Tiam O'Shian III' was born before 'Ch.Wankee' and, like him, was a key progenitor of the modern Siamese breed. The breed however, was still exceedingly rare in England, and it did not take serious hold of the fancy until a pair from the Palace in Siam, were given in 1884 to Mr Gould, who was Consul General in Bangkok. These were 'Pho' and 'Mia', whom he gifted to his sister, Lilian Gould (later Mrs. Veley). Their kittens, 'Duen N'gai', 'Kalahom' and Kromata' were shown at the Crystal Palace in 1885, but sadly died shortly afterwards. 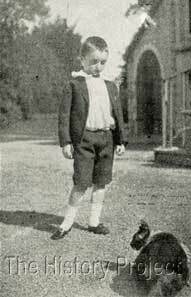 In 1886, another pair with kittens were imported by Lady Vyvyan and her sister Miss Forestier Walker, from which eventually sprang the famous 'Tiam O'Shian' strain of Siamese. Mrs. Cunliffe Lee's 'Meo', dam of 'Tiam O'Shian II'. Described by Charles H. Lane, as 'a great prize-winner at leading shows'. Miss F. Moore's 'Siam', the sire of 'Susa', dam of 'Tiam O Shian III'. 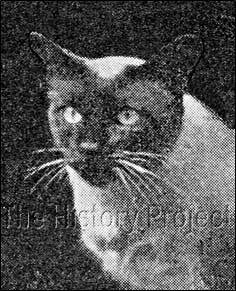 Other progeny from the lines included 'Goblin', a Siamese male directly out of the first Thai imports 'Tiam O'Shian I' and 'Susan', who early on became the property of Her Grace, the Duchess of Bedford, President of the National Cat Club. Another was 'Mafeking', (who does not appear in any registration records) but whom we may surmise is likely to be related to Mrs. Armitages 'Cora' and possibly a son or brother to 'Tiam O Shian II'. What we do know, is that he was retained, however, by Mrs. Vyvyan; who obviously saw value and potential in him. Sadly there are no records of progeny from either of these males. 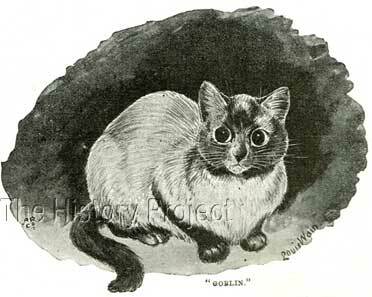 Two images of 'Goblin'. Above left: an interpretative sketch by Louis Wain. Above right: a photograph of Goblin, with the Marquis of Tavistock, son of the Duchess of Bedford, taken outside the residence at Woburn Abbey. 'Mafeking', the property of Mrs. Vyvyan. Thus, in carefully breeding out and then partially in again, the lines behind the 'Tiam O Shian's were firmly established, and culminated in 'Tiam O Shian III', who then himself sired a string of quality Siamese. Among them, was the topic of this discourse, 'Tiam O'Shian IV', plus his quality siblings; one of which was to become the forebear of many more generations of Siamese carrying the 'Tiam O' Shian' strain into a future, which included dissemination of the famous bloodline, world-wide. Having covered the establishment of the 'Tiam O Shian' strain into its third and fifth generation respectively, it is important to note that two cats from the line were responsible for the creation of 'Tiam O'Shian IV' and his worthy siblings. 'Tiam O'Shian IV' was born 15th August 1899, the product of a father-daughter breeding, between 'Tiam O'Shian III' and his already famous daughter, 'Polyphema'. 'Polyphema' was already a respected show specimen, who just also happened to be a reliable brood queen. She was herself born in 1885, the product of 'Tiam O'Shian III' and 'Priscilla', a double daughter of the original 'Tiam O'Shian I' (out of Bangkok), 'Priscilla's dam being 'Mrs. O'Shian', and 'Mrs. O'Shian's dam being 'Loquat' a full sibling to 'Goblin'. Thus the only outcrosses in all these generations were those established behind the sire, in Mrs. Lee's 'Meo', Miss Moore's 'Siam', and Mr. Harringtons 'Mechi'. In all other respects, the only cats in the pedigree were 'Tiam O'Shian I' and 'Susan', both from Thailand. This weave of bloodlines was now to prove its worth. This particular breeding had been done earlier the same year, when in February, it produced an outstanding female, in 'Eve', who subsequently became a Champion. We can imagine, that with the arrival of 'Eve' in the first litter, a decision was likely taken to repeat the breeding in the hope of acquiring a male with the same qualities. And this turned out to be 'Tiam O'Shian IV', who was subsequently retained by Mrs. Vyvyan. And so it appears that 'Tiam O Shian IV' had a considerable share of fans, and some fanciers at least, looked to him to help secure the future of the breed. That honour however, would be left to one of his siblings, who when combined with 'Ch.Wankee', produced the start of a new dynasty, combining the advantages of both bloodlines. 'Eve' became the property of Mrs. Backhouse, who was mentored by Mrs. Forestier Walker and Mrs. Vyvyan. 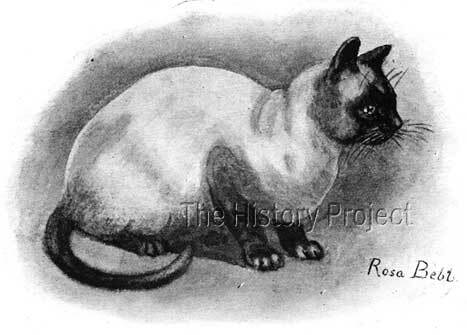 Mrs. Backhouse became an ardent supporter of the Siamese breed, and when the Siamese Cat Club was officially formed in January 1901, she was elected as its Honorary Treasurer.? 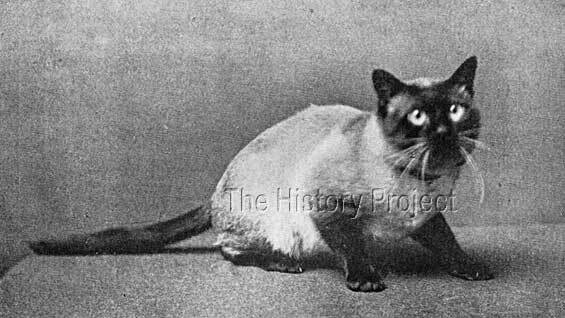 'Ah Choo', who was a most appealing looking Siamese, had distinguished wins at Manchester in 1901, followed by Firsts at the Botanic and Crystal Palace Shows of 1902. Her photo, by Landor, is a delightful and revealing study, giving us an insight into what appears to be her friendly, almost 'impish', inquisitive personality. It also shows us the beautiful contrast between her light body colour and her dark, well defined points; a genetic trait, which has no doubt been passed down through the generations, through her sister 'Eve'. It is important to remember that power behind these breedings was not 'Tiam O'Shian III' alone, but that 'Polyphema' as the dam of them all, was equally responsible for the success of this line going forward into succeeding generations. Her beauty which she shared in equal measure with 'Eve' was the base line for future generations to build upon. She was the direct line-breed back to the original Tiam O'Shian I, and it is through her, that the tripling on him and the preservation of the line to 'Susan' (Imp. Thailand) is made. It appears unlikely, despite being able to trace at least eleven registered progeny sired by 'Tiam O'Shian IV', and even a few grand-progeny, that in fact any of his personal bloodstock survives to this day. But we shall list here all the progeny currently known. This could, at least in part be due to the fact that of the eleven known kittens he sired, only three of these were confirmed females, and only two of those produced a second generation. His personal contribution appears to run out when we take a glimpse into subsequent generations. The family lines however , do survive through his sibling 'Eve' and her subsequent progeny. More than anything else however, he stands as a testament to the strength of his sire and to the consistency of 'type' in his familial lines. From 'Mayfield Gem', a daughter of 'Royal Siam' and 'Maimoune' owned by Mr. E. Ratcliffe, a litter born 1st April, 1901. Of this litter we have only one kitten of record, named 'Madcap', (a male). From 'Jun', a daughter of 'Prince of Siam' and 'Kinck' owned by Miss Cartwright, a litter born 12th June, 1902. Of this litter we have only one kitten of record, named 'Kunkan', (a female). From 'Opossum', a daughter of 'Chicko' and 'Chocla' owned by Mrs. G. Richardson, a first litter born 18th July, 1902. Of this litter we have only one kitten of record, named 'Prince Titi', (a male). From 'Darling', an unknown female possibly synonymous with 'Cairo Darling', with the owner of record and breeder being Mrs. Parker Brough, in whose care the sire was entrusted by Mrs. Vyvyan. From a litter born 1st February, 1903, we have only one kitten of record, named 'Wynnstay Kim', (a male). From 'Opossum', a daughter of 'Chicko' and 'Chocla' owned by Mrs. G. Richardson, a second litter born 23rd April, 1903. Of this litter we have four kittens of record, named 'Bunejip', (a female), 'Kabeyun' (gender not recorded), 'Mowgli', (a male), and 'The Sirdar', (a male). 'BUNEJIP', This female appears to have been sold for breeding to Mrs. L.E.Musson. 'KABEYUN' Gender not recorded, but probably female, appears to have been retained by Mrs. Richardson for breeding. 'MOWGLI', This male appears to have been initially retained by Mrs. Richardson. 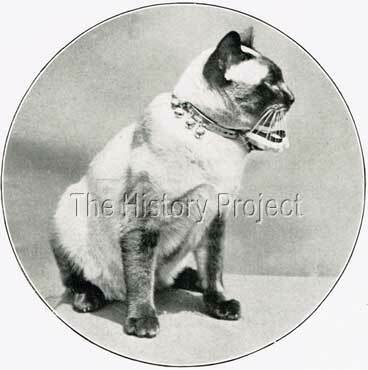 'THE SIRDAR', This male also appears to have been retained by Mrs. Richardson, and subsequently exhibited, gaining a Second at the National Cat Club show of 1903. From 'Muski', (whose sire and dam are unknown), owned by Miss Brett, a litter born in May 1904. Of this litter we have only one kitten of record, named 'Lovell Beauty' (a female). From 'Kybie', (whose sire and dam are unknown), owned by Mrs. Aubertin, a litter with no recorded date of birth, which resulted in one kitten of record, named 'Kew Ti Wan', (a male). As can be clearly seen, it was through no fault of his own that 'Tiam O'Shian IV' appears to have been unsuccessful in creating a lasting addition to the Siamese gene pool. And this is a timely reminder to us all, that nothing is secure, no matter how many preparations we make and how much care we take, fortune itself plays a part in what survives and what doesn't. As a consequence, it was his sibling 'Champion Eve' who left the most lasting legacy, and through whom, the 'Tiam O' Shian' strain was to pass into future generations. From her breeding to 'Ch. Wankee' came both 'Boojum' (a male) and 'Bandoola' (a female). 'Boojum' in turn was the sire of 'Boojum II' who when line-bred to his auntie 'Bandoola', produced the legendary 'Ch. Prince Vudighi'. Thus, a doubling of the original combination of both the 'Wankee' and the 'Tiam O' Shian' strains, were passed through 'Ch. Prince Vudighi' (a new pillar of the Siamese breed), down through son 'Ch. Bobolinko' to cats such as 'Bigabois', and 'Litabois' and eventually 'Ch.Bonzo'; and down through son 'Southampton Ju-Jitsu', to cats such as 'Prince Souti' and eventually to 'Ch. Beauty Boy' and 'Ch. Slightly'. From these few cats may be traced virtually every registered Siamese cat living on the planet today. Stud advertisement for Mrs. Vyvyan's 'Tiam O'Shian IV'. A Trading Card from the Cowan's 'Noted Cats' Series, produced in 1925. This was card No.6 out of 24. The notation on the back of the card reads: "This is another cat of high repute. 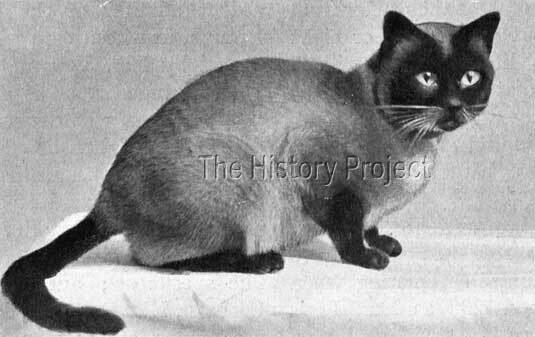 He is a magnificent type of Siamese, even in color, with deep seal points." With the death of 'Koschka' in 1900, 'Tiam O'Shian' certainly was arguably the best male to be exhibited in England. 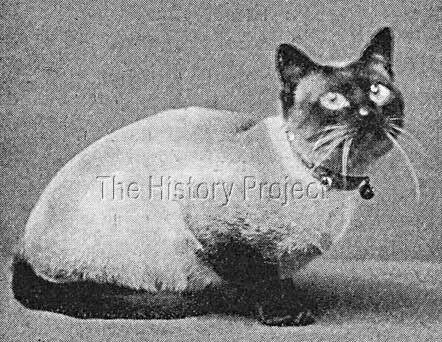 His successes in 1901 alone, were quite phenomenal for a Siamese; taking as he did, the Challenge Cup at Westminster, a rare Best Cat in Show at the Sandy Show, followed by both the Breeders Cup and Challenge Trophy at the ensuing Crystal Palace Show later that same year. His dominance would not be threatened until 1903, with the sad death of 'Ch. Wankee', and the rise on the show circuit, of Mrs. Norris's 'Kew King of Siam'. 'Tiam O'Shian IV' was, and remains, a glowing example of line-breeding and selective outcrossing, done to attain a distinctive familial look, one which successfully held sway on the show circuit, in both males and females for a number of years. In a sense, he remains the epitomy of the 'Tiam O Shian' strain, and stands as a testimony to the careful planning executed in the breeding of Mrs. Vyvyan and her sister Miss Forestier Walker. The results speak for themselves, and the cats continue to speak to us across time. Photos and quotations as per sources quoted.